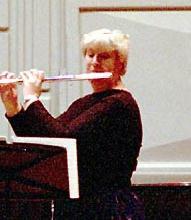 Sue Makeever is the principal flutist of the Billings and Bozeman Symphonies, the Intermountain Opera, and the Montana Ballet Orchestra. She is a member of several chamber groups, including the Yellowstone Chamber Players, Kreutzer Trio, and Flutes and Friends. In 2005, she was invited to perform with the Muir String Quartet, playing the fourth Brandenburg Concerto. Sue earned a Bachelor of Science Degree in Music Education from the University of Illinois, a Master of Music from Northwestern University, and completed all her course work and recitals toward a Doctor of Music from Florida State University. Sue has studied with James Galway, Jean-Pierre Rampal, Geoffrey Gilbert, Charles DeLaney, Walfird Kujala, and Marcel Moyse. She has taught at the University of North Texas, and MSU-Billings. In the summer Sue is on the faculty of the Red Lodge Music Festival and Rushmore Music Camp. She maintains a large private studio in Bozeman, and is an active performer and adjudicator. This is her 18th year at Red Lodge Music Festival.